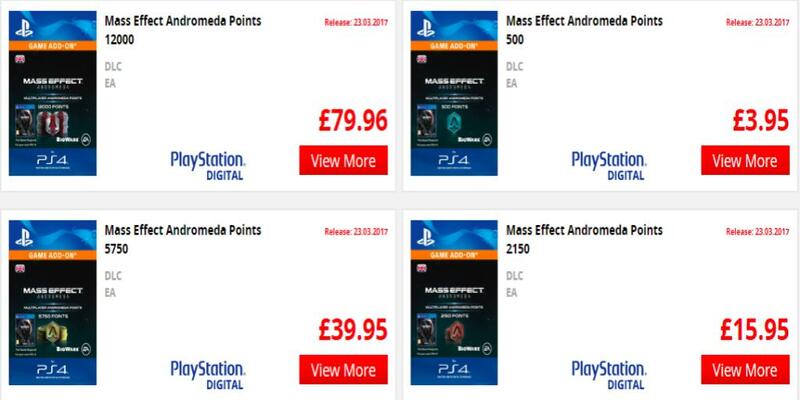 Mass Effect: Andromeda Multiplayer Has Pricey Microtransactions | Nerd Much? 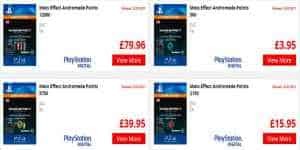 You can buy points in six different increments, 500 points for £3.95, 1020 points for £7.96, 2150 points for £15.95, 3250 points for £24.95, 5750 points for £39.95, and 12000 points for £79.96. No US retailers have been posting these points, but the conversion is somewhere around $5 for the 500 points and $100 for 12000. Again, these points likely won’t be used to purchase individual items, but bundles and packs which usually contain strong and hard to find weapons and armor, much like Mass Effect 3. Though if these boxes are mystery boxes, spending the money seems less worth it. Hopefully they won’t be and BioWare will list explicitly what is inside each. If this all sounds totally lame to you and microtransactions are as hateful as 1-2 Switch, don’t worry. BioWare had kindly made it clear that multiplayer is completely unnecessary for the single player campaign and provides no more advantage that you can’t get in the game itself. Or, you can even dispatch Strike Teams and let them do the work for you and reap the rewards later. Are these points a little too expensive to you? Will they be worth it? Let us know in the comments!